Trump's business advisory councils have been dissolved. But protestors aren't done yet with JPMorgan CEO Jamie Dimon and Blackstone CEO Stephen Schwarzman. A collection of New York-based advocacy groups marched to the Manhattan headquarters of both JPMorgan (JPM) and Blackstone Wednesday afternoon. They want Dimon and Schwarzman to do more to oppose Trump. "Quitting Trump's business council should have been an easy decision, and it is just the first step. Corporate leaders have a responsibility to stop Trump from carrying out his now obvious agenda of white supremacy -- including ending financing for private prisons and immigrant detention companies," said a spokesperson for the Center for Popular Democracy, one of the organizing groups. The protest was originally organized to deliver petitions with 400,000 signatures asking both executives to cut ties with the White House. Schwarzman and Dimon both served on Trump's economic advisory panel. Schwarzman chaired the group, formally known as the Strategic and Policy Forum. On Wednesday afternoon, both the Strategic and Policy Forum and a manufacturing jobs council were dissolved. Both Schwarzman and Dimon had issued statements condemning a rally of white supremacists that turned deadly in Charlottesville on Saturday. But neither explicitly mentioned his role on the council until Wednesday. Dimon put out a statement to show that he "personally supported" breaking up the Strategic and Policy Forum. "I strongly disagree with President Trump's reaction to the events that took place in Charlottesville over the past several days," he said. Related: Eight business leaders have quit Trump. Who's next? Schwarzman did not release a personal statement on Wednesday, but Blackstone distributed the remarks put out by the Strategic and Policy Forum. "As our members have expressed individually over the past several days, intolerance, racism and violence have absolutely no place in this country and are an affront to core American values," the statement said. Since the weekend, a growing number of business leaders resigned from another Trump advisory council, the Manufacturing Jobs Initiative, to protest the president's response. Trump has repeatedly said the violence in Charlottesville was perpetrated by "many sides," and initially failed to specifically condemn the white supremacists who organized the Virginia march. 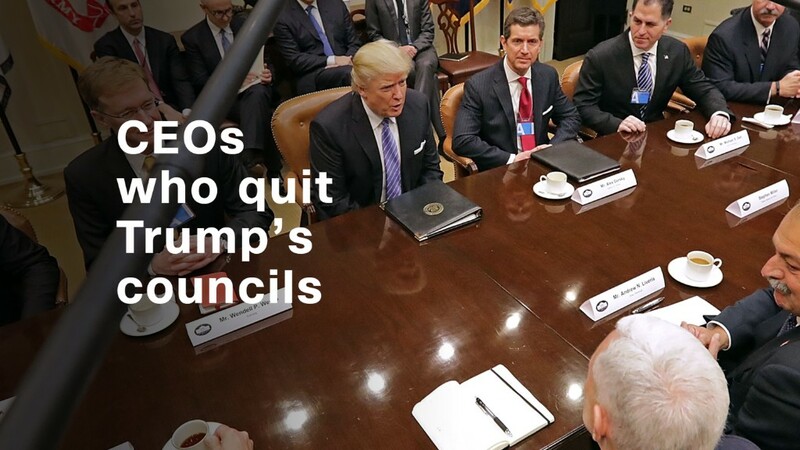 One of the organizations involved in Wednesday's action at Blackstone and JPMorgan, Color of Change, launched a broader campaign called #QuitTheCouncil, which pushed executives who sit on Trump's job councils to resign in the wake of the president's response to Charlottesville. In particular, it put pressure on PepsiCo (PEP) CEO Indra Nooyi, who sat with Schwarzman and Dimon on the Strategic and Policy Forum. Some of the organizing groups -- including Make the Road New York, New York Communities for Change and the Center for Popular Democracy -- are part of a wider progressive initiative called "Corporate Backers of Hate." The campaign targets businesses that it says "stand to profit from Trump's hateful agenda."